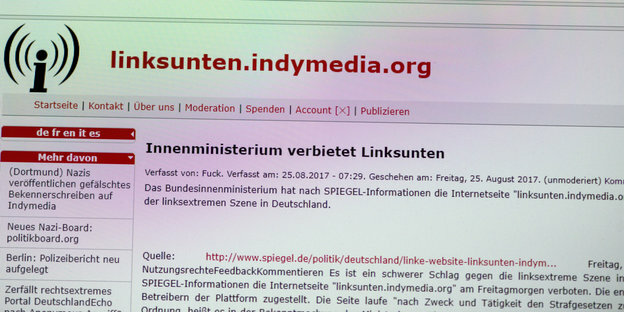 The German government banned the linksunten.indymedia website today. According to German mainstream media the decision was given to 3 alleged “operators” of the indymedia platform. Refresh the page to read the updates. Screenshot: Report that the German federal interior ministery banned linksunten. Image: 20 vans with riot cops in Freiburg, Germany after raids against Linksunten earlier today. #Linksunten: “We Will Be Back Soon” – Greetz from #Streisand | Enough is Enough! August 27: Demo in #Berlin: We Are All #Linksunten! | Enough is Enough! First #NoG20 Court Verdict & #Linksunten Ban: Banana Republic #Germany Shows Its Ugly Face | Enough is Enough! #France: State Repression Against #Indymedia #Grenoble and #Indymedia #Nantes | Enough is Enough!